Please forgive my crappy photo set-up here. I was overly excited about having a bag of raw cacao nibs in the house so went a bit overboard with layout. However, look! We have raw cocoa nibs in Taipei! Could not believe it when a friend from another city in Taiwan, sent me images of the nibs she found in her city. So Amber, my assistant and I, tracked the company down which resulted in a meeting, a gift bag of nibs and powder and the possibility of collaboration. All good. Let’s get on with it, then. The Breakfast Bowl of Love is made for typhoon days like this, or cooler Fall weather. It’s packed with so much amazing nutrition, but also layered with warming flavours and smooth to crunchy textures which create a complete experience for eyes, mouth, nose, heart and belly:-) I made this recipe for two. As usual, I didn’t measure anything. That is going to take some time for me to be consistent with. It feels like it’s taking away from the creative experience, but I will do it. Blend the meat of both coconuts with 1.5 cups of coconut water. Blend till smooth. Slowly add chia and blend till incorporated. Remove the coconut/chia mixture from the blender and pour into two small breakfast bowls. Divide the cacao nibs and pistachios between both bowls but hold some back for garnishing. Stir the nibs and nuts in. Let it set for a few hours or overnight in the fridge. 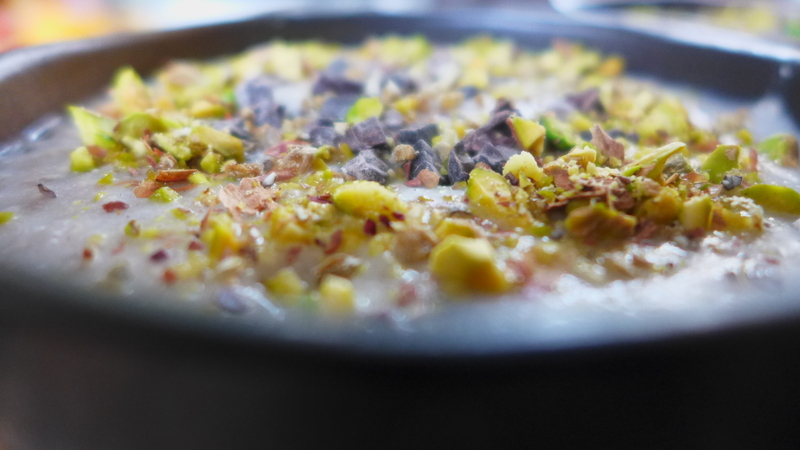 When you are ready to serve, top the bowls with more nibs and pistachios. 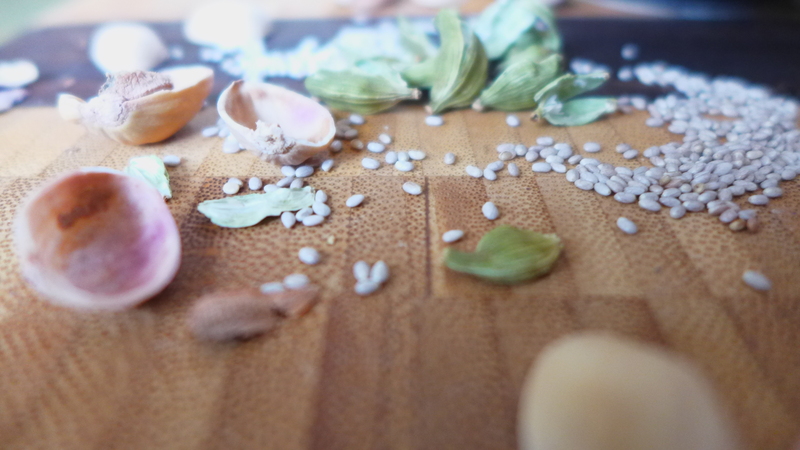 Crush the cardamom and sprinkle on top. This will keep your belly full for half the day and give you loads of energy and warmth. 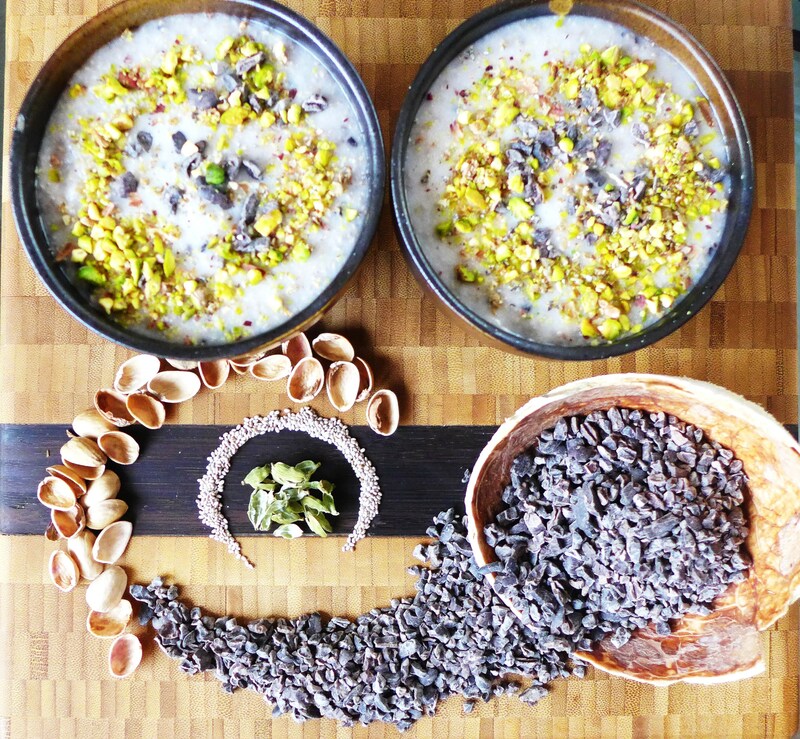 This entry was posted in Raw Food and tagged breakfast ideas, cardamom, chia seeds, coconut, coconut meat, coconut water, Fall breakfast, Pistachio, pistachio nuts, raw cacao nibs, raw food Taipei, Taipei, Taiwan by Chef Prish. Bookmark the permalink. I actually very much liked the photo and the creativity! Wonderful creation!! I am very keen to try but perhaps within a workshop setting first. Awesome news about the cocoa nibs. P.s. your picture looks Typhoon inspired to me. Nice work!